Happy Saints: 33% off Happy Saints Jesse Tree eBook! Jesse trees are often associated with Advent but the Happy Saints version can be used anytime! It features major characters of the Bible, making it a great tool for Bible classes all year. And with 33% off, it saves to plan ahead for Advent! 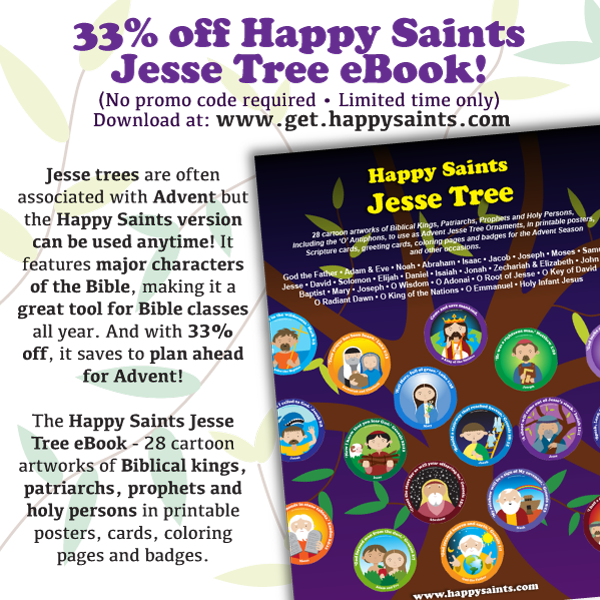 Download the Happy Saints Jesse Tree eBook now and get 33% off! The Happy Saints Jesse Tree eBook - 28 cartoon artworks of Biblical kings, patriarchs, prophets and holy persons in printable posters, cards, coloring pages and badges.